How do signature fields work? 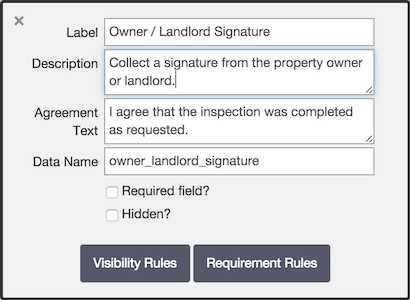 Understanding how signature fields work to collect signatures in the field for reporting. 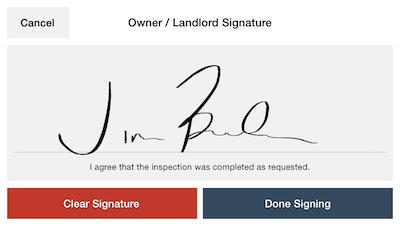 Signature fields let you capture an electronic signature on your survey. This is useful when conducting inspections or site surveys that require someone like an auditor or a property owner to sign off on the work. The "Agreement Text" can display a total of 5 lines of text. The amount of text and the total character limit will vary based on the device's screen size/resolution. Higher resolutions will be able to fit more text within the allotted 5 lines. On the mobile apps, when you tap on a signature field you are presented with the screen where you can then sign with your finger or stylus. When using the web app, there is no signature capture capability like the mobile apps. Instead, you will be presented with the option to upload a signature file.